Emily graduated from the University of Liverpool in 2006, working in several clinics in the Midlands and Surrey before joining The Cat Doctor in 2018. She is passionate about the care of older cats, particularly managing chronic pain, and is trained in veterinary acupuncture. 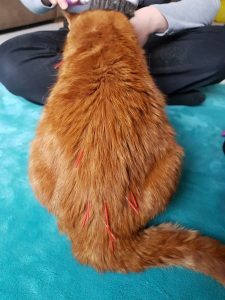 Having seen the wonderful benefits of acupuncture in many of my furry patients, including my beloved cat Oscar, I was always very keen to train in this skill myself. So when Amy and Robert shared my interest and agreed for me to go on an acupuncture course I was very excited!! In November 2018 I set off to Swindon for a foundation course in Western scientific acupuncture. The course was to be four intensive days of lectures and practical sessions and it didn’t disappoint. Traditional Chinese acupuncture evolved over many centuries from a number of philosophies and is based on the belief that disease is caused by disruptions to the flow of energy, or qi (pronounced chi), in the body. Qi is said to flow around the body in channels or meridians in a specific pattern. By placing needles in points along these meridians it is possible to improve the flow of qi and restore the balance, thereby exerting a therapeutic effect. Western veterinary acupuncture is a related but more scientific adaptation based on modern medical concepts and is used as a therapy (often in addition to pain medication) following a standard clinical diagnosis. Points to be needled are chosen based on neurophysiological principles. 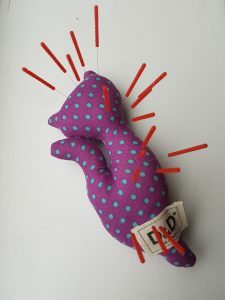 On the course we learnt about trigger points – tender, tight knots of muscle (for example, we often have these across our shoulders) which may be needled during acupuncture treatment. Animals can develop these trigger points following trauma or in muscle that is overworked, or in muscle having to cope with the strain of degenerative joint disease e.g. arthritis. Trigger points are not inflammatory and therefore anti-inflammatory treatments do not treat them, although they may reduce some of the associated pain. Stretch and applying pressure is often used to treat trigger points, for example, massage. Dry needling as is performed in acupuncture is undoubtedly one of the most effective methods of applying pressure to discrete areas of tissue and therefore appears to be a very effective method of treating trigger points. We spent a practical session examining the muscles of various animals to identify what trigger points feel like and what reaction they might induce. This has really helped me in how I examine patients to identify their source of pain. Many cats enjoy acupuncture sessions as they mean extra cuddles and extra treats! In people acupuncture can be performed on the basis that the patient has given consent. However, in animals it is a bit tricky to obtain their consent! Therefore, ethically we are not allowed to perform acupuncture on a healthy animal. So, on the course we actually performed acupuncture on each other to experience the sensation of acupuncture ourselves and to get feedback from our partner about our needle placement. This was particularly useful practical experience. Everybody experiences the sensation of the needle differently and the optimal response is to achieve ‘de qi’ which is said to resemble the pleasant heaviness you might feel in a muscle after exercise. I felt a variety of sensations depending on where the needle was placed; mostly I felt a warming or tingling sensation which I found quite pleasant! We were also taught about electroacupuncture which is where a small current is applied to the acupuncture needles. Again, we tried electroacupuncture on ourselves on the course. This gave a stronger sensation but was also very pleasant and felt similar to a TENS machine. The needles have to be collected and counted at the end of the procedure to ensure none are left behind. In addition to trigger points, we also learnt about segmental acupuncture. This involves placing acupuncture needles at points that are distant from the source of disease. 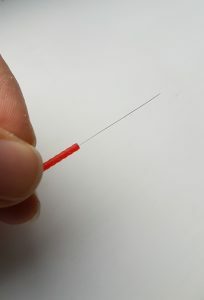 For example, acupuncture can be used to treat the pain associated with cystitis – it is not possible to place an acupuncture needle directly into the bladder but it is possible to have an effect indirectly by placing needles close to the spine where the nerves exit which supply the bladder. This principle can also be used for treating other diseases of the abdomen, for example, constipation where the acupuncture can help to optimise the function of the bowel. Finally, the course covered the safety and side effects of acupuncture which is obviously very important! Serious adverse events related to acupuncture are very rare and most problems can be avoided with a sound knowledge of anatomy and adequate training of acupuncturists. The aim of this foundation course was to teach safe and competent needling and by the end of the four days I felt ready to start treating patients myself. I had my ideal first patient waiting for me at home, my elderly cat Oliver who is nearly 19 years old and has arthritis of his elbows and hips. We also believe that Oliver has some degree of laryngeal paralysis where his throat muscles don’t work so effectively and as a result he is not able to purr very loudly. I started with placing needles in points along his spine, pelvis and back muscles. He tolerated the placement of the needles very well and seemed relaxed during the treatment. He did however seem a little more stiff in his back legs afterwards and I felt a bit concerned. But then I remembered that on the course we had been taught that this was quite a normal response and was a sign that I’d actually hit the right spots! This settled down within the expected 48 hours. 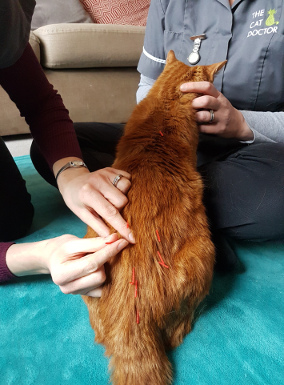 Most cats aren’t concerned by the placement of acupuncture needles, the hardest part is often getting them to sit still for a few minutes! Offering a meal is a good way to keep them in one place during their session. I repeated the treatment once a week for four weeks, building in points over his forelimbs by the third session, after which he had a lovely purr on the sofa afterwards, I was so thrilled! He also attempted a little scratch of one of his ears which, when I saw him do it, I realised was something that he hadn’t felt able to do in quite some time. There is a point below the knee joint which helps with immune function and can stimulate appetite and so I was keen to try it on Oliver. After his treatment he wolfed down a whole bowl of Thrive food, brilliant I thought!! After Oliver’s four initial sessions he was definitely more his old self, coming to sit on our laps for cuddles again and even chasing leaves in the garden. I am continuing to give him treatments every two to three weeks as by the end of that time he is starting to show more stiffness again and after his treatment he is definitely perkier in himself and walking better. I was so pleased with the results I saw in Oliver and I can’t wait to see how much acupuncture can help the rest of our feline friends!! 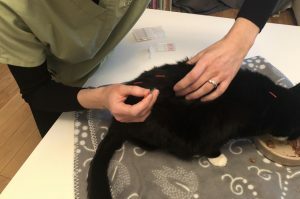 How can you book acupuncture for your cat? 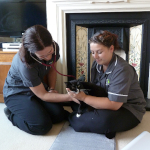 The Cat Doctor is a feline-only mobile vet providing at-home veterinary care for cats in North Surrey and South West London. 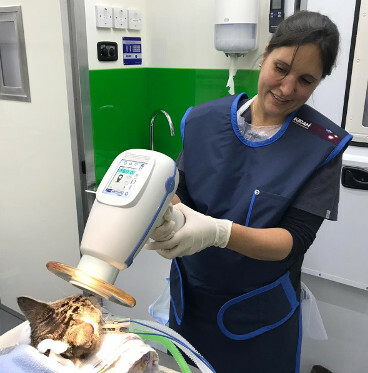 We can perform most veterinary services in the comfort of your own home and if surgical or dental procedures are required we bring our mobile operating theatre to you.